I first picked up Formula D at Out of the Box Games in Zeeland in 2009. After I read the rules, I was not impressed. It was roll-and-move. I didn’t think such a game could be compelling. But I taught the game to my little brothers. And we had a blast! Since then, I’ve acquired all the maps for Formula D. (I don’t have any of the maps from Formula De. The maps for Formula De are compatible with the rules of Formula D but not compatible with the rules for my wallet). Our Thursday night group has the right temperament for a league play of Formula D. Last night we had our first session. Here are some of the details of that session along with a look at the optional rules for Formula D.
We had five gamers last night for the first session. We used the original game board: Monaco. The Monaco board is interesting because it has 1, 2 and 3 stop curves on it. There are also two straightaways that will allow a clever player reach 6th gear. The game started with Joe in pole position. I was middle of the pack. (Nick Sima was in dead last). Joe rolled a “1” on the black die so he couldn’t move. This is the second time this happened to Joe. About half way through the first of our two laps, there were some definite haves and have nots. I was in a strong position along with Jake. Matt and Joe were in last. Nick took a pit stop. He was positioned at the mouth of the pit when I wanted to go into the pit. This prevented me from going in so I played without a pit stop. I had a decent amount of tires, brakes and gears left. I only had 1 body point left because Jake and Nick kept ramming me into the guide rails. During the 2nd lap, I was in a strong position along with Jake. He and I kept overtaking each other for the lead. Joe, who was in last for most of the first lap, didn’t need to break for a pit stop. He kicked it up to 6th gear and caught up with us. Going into the home stretch, it was going to either be me, Jake or Joe for the win. I rammed my car into Jake but I was the won that rolled a “1”. My poor formula 1 racer couldn’t take it. I was a “DNF” for the Monaco race. I think everyone had a good time with it. And I think with some of the optional rules below, the game will really shine. Each session will use a different map. There are six map boards to date. And each is double sided. Some of the map sides are not conducive to Formula 1 racing. They are geared to the street racing optional rules–an option outside the realm of this league. Monaco, Sebring, Hockenheim, Valencia, Singapore, Buddh, Baltimore, New Jersey, Sotchi and Austin will comprise this first season of Formula 1 racing at The Gaming Annex. I wanted to have a set of rules for a league that negotiated several constraints. I want first place to get the lion’s share of points. This will ensure everyone is trying to win the race. I want to encourage people to show up to league nights as well. So even if you get a “DNF” (or did not finish) you get some points. And I want racers who did finish to get more points than those who DNF. The goal is to have the most points at the end of the season. The season is comprised of 10 sessions, one at each track. To this end, I’ve constructed the following point system. This is not written in stone so feel free to give me feedback. In yesterday’s game, we had five racers. Joe came in first and thus scored 10 points (2x the number of players). Jake came in second and scored 5 points. Nick scored 4 points (½ times the number of players + 1). We round up in this case. Matt scored 3 points. And I scored 1 point. BOOOOOO! The addition of the weather rules is a no-brainer for serious players. We didn’t use it last night because we still had a novice or two. But going forward, the weather rules will be in full effect. At race start, you roll a die and compare the result to the map’s weather chart. There are three possibilities: rain, changeable weather or sunny. If the race is sunny, there are no real changes to the rules. Rainy weather makes collisions twice as likely (on a 1 or 2) along with making road handling damage more likely (on a 1 through 5). Due to the cooler temperature, rainy weather helps with engine damage. You only damage your engine on a roll of 1 through 3 instead of the normal 1 through 4. Now, when the weather is changeable, you reroll on this chart under the same circumstances as when you check for engine damage. Changeable weather starts out as “Sunny” (changeable). But if you reroll on this chart, it could become “Sunny” (invariable) or “Rainy” (changeable). Thus, the weather can undergo some important changes that will effect game play. And the optional rules afford players a nifty decision for how to deal with this: tire selection. Players can decide which tires to use at the beginning of the race. There are three types to choose from: hard tires, soft tires and rain tires. Each has there own pluses and minuses. Hard tires have no special rules if it’s sunny. However, racers with hard tires will experience less control over their Formula 1 car if the weather is raining. The car will move an additional three space if it is raining and the movement includes any space in a curve. Soft tires give a racer a lot of control if it’s sunny. The racer may move an additional space on each of his turns. If he overshoots any curve, the damage to his tires, due to the fact that they are soft, is doubled. But soft tires are not very good in the rain. Soft tires suffer the same rain penalty as hard tires. Soft tires also require a pit stop. Failing to take a pit stop will nullify the bonus of the soft tires while tripling the damage from overshooting a curve. Rain tires are the most efficient way to slosh through a drizzly day. If it’s raining, rain tires cause you to travel one additional space in a curve (unlike the other tires which make you travel three additional spaces). Rain tires, however, are not so good when the weather is sunny. The penalty for overshooting a curve is doubled. Because of the difference in tire selection, players now have some extra choices when making a pit stop. Players have a few different choices when making a pit stop. They may change their tires to one of the other types listed above. They may then choose to get all of their tire wear points replenished or get two wear points added to any system. One of the house rules I read that I liked was that you could continue to skip your turn and stay in the pit. This would give the player an additional 2 wear points to any system (up to their starting total). This is a house rule we might try out. Our crews and equipment will be heading to Sebring, Florida for the second Formula 1 installment of the season. The weather forecast is 88 degrees with a 15% of rain. The race will be televised live at The Gaming Annex in Muskegon one of these Thursdays, quite possibly next Thursday. Check local listings for details. I thought it would be cool to have an ongoing segment about what games we played at the Gaming Annex so people would know what actually takes place within our four walls. Here is our September installment. The battle between York and Lancaster heated up at the Gaming Annex. This game is quite fun for what it is. And it needs to hit the table more often. The Cold War is fought in Muskegon almost every Sunday. Thanks GMT Games. The USSR defeated the USA in a game of Twilight Struggle this month. This is my second favorite game. Only TI3 is better. I love it! The Three Musketeers along with their trusty d’Artagnan slipped past the Cardinal’s dragnet of goons and deftly saved the Queen from embarrassment. This was our first play of this. And I am confident it will get much more table time in the coming months. X-Wing Miniatures Game is The Gaming Annex’s favorite minis game. After teaching Nate how to play, he went on to defeat me 🙁 His Green Squadron Pilot (A-Wing) slapped the #%$@ out of Darth Vader. Now I have to trade this game. Perry Rhodan: The Cosmic League is a solid offering from Kosmos & Z-Man games. Players take turns picking up/delivering in this action-move game. It only accommodates two players but it plays two players very well. 30 minute run time is also attractive. Pirate’s Cove is a good, family game. Arrr! 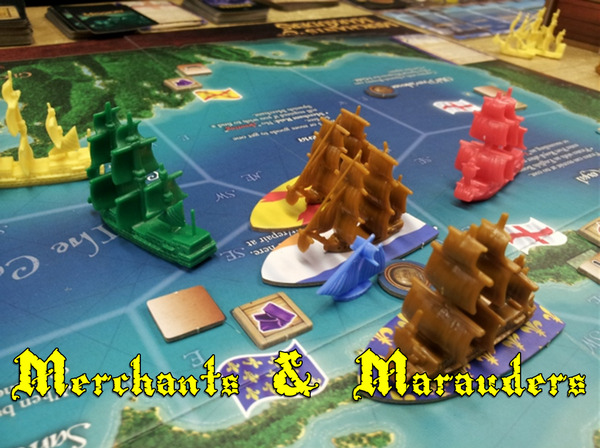 We took to the high seas with this adventure game. Tense battles and lots of booty were had by all. Martinique is a nice tactical/logistical/deduction game for two. The pirate theme is totally pasted on but that shouldn’t detract from this otherwise filler-esque game. There’s plenty of High Society at The Gaming Annex. A nice 4 to 5 player filler, High Society sees lots of table time at the Gaming Annex. It’s got a few hooks that keep the game interesting. The war for Westeros was finally decided. Historians called it, “The Siege of Muskegon”. We had a six player game of A Game of Thrones this month. We used the expansion A Dance of Dragons. This expansion gives a different set up to the normal rules. It was quite good. We played the full rules to Formula D. This game has it all: thrills, spills and chills. If you do not like NASCAR or other forms of racing, you will still like this game. I am not a fan of NASCAR or its ilk either. But I do like this game. We cut our teeth on Fury of Dracula. Nate, who loves this game, had never had the chance to play as Dracula. Nick and I hunted him across the North Sea and the English Isles. We trapped him in Iberia where we finally buried the stake, sending him to the nether reaches. The Muskegon Area Gamers assembled their adventurers in Dungeon Roll. Dungeon Roll is my favorite 2 player filler. The theme is quite good for a filler. And the decisions you make are often tough. We played a tense game of Confusion. This is a deduction/logistical game where players know how their opponent’s pieces move but must deduce how their own pieces move. It’s very good but can be heavy. We played several scenarios of Memoir ’44 this month. This game is fantastic! I love the hand management aspect. I love trying to set traps for my opponents. I highly recommend it. The Muskegon Area Gamers plays Mage Knight about once a month. As you can see, we have eclectic gaming tastes. And we certainly do not agree unilaterally on any game. This is also an abbreviated list of games. We played several more than what is listed but all of them cannot be crammed into a single post.